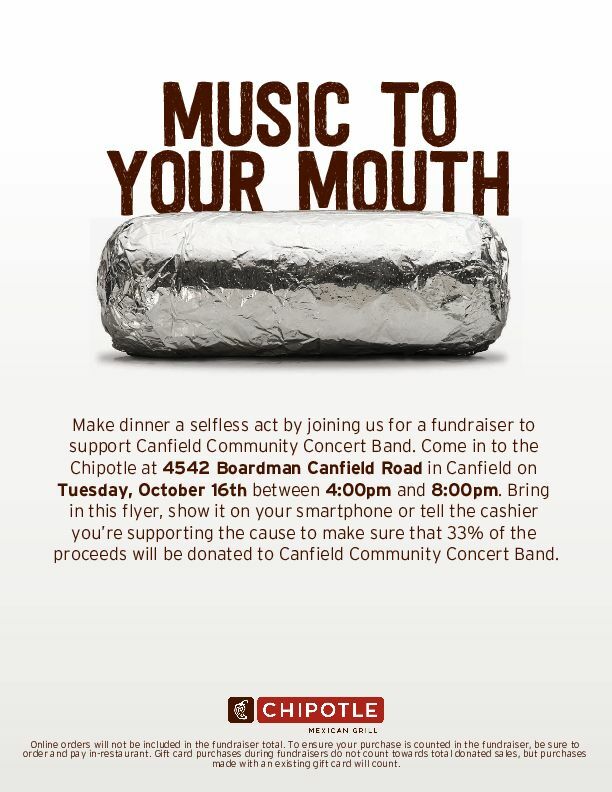 Support the Canfield Community Concert Band with your purchase of dinner at Chipotle in Canfield on October 16th from 4 to 8 pm. Mention the band to the cashier or show this fiyer and 33% of your purchase will be donated. Get complete details here and join our event on Facebook to let us know you'll be there! Band members, we'll start rehearsal late to give everyone an opportunity to get dinner and support the fund raiser. 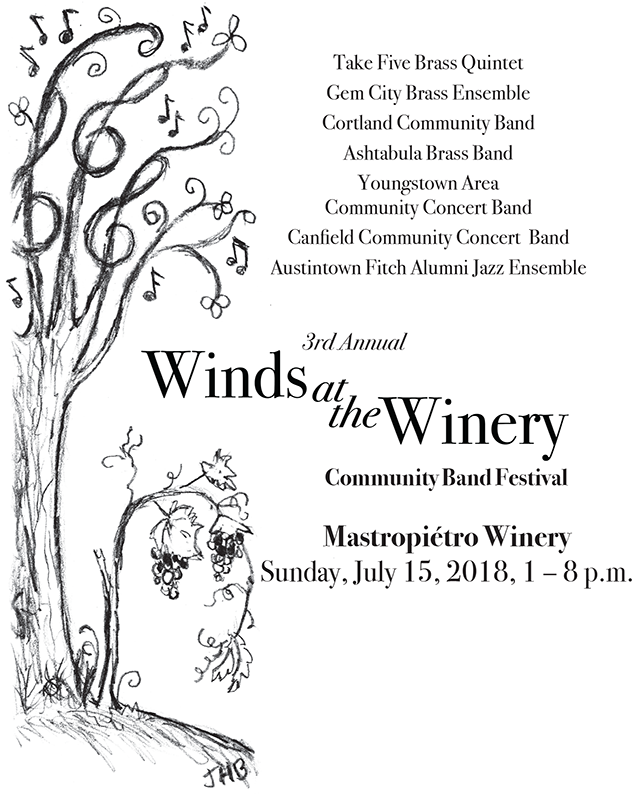 We are pleased to present the third annual Winds at the Winery Community Band Festival! Spend a summer afternoon at the winery and enjoy several local community bands. This year up to 15 arts and crafts vendors will be provided space to exhibit and sell their products. If you are interested in being a vendor, please download this form for details and to register. Food and Wine* will be available for purchase throughout the event. Performances by Take Five Brass Quintet, Gem City Brass, Cortland Community Band, Ashtabula Brass Band, Youngstown Area Community Concert Band, Canfield Community Concert Band, and Austintown Fitch Alumni Jazz Band will take place throughout the afternoon, starting at 1. There will be a 50/50 drawing, a raffle, and donations will be accepted, all to benefit Angels for Animals in support of their Angel Wing capital campaign. Raffle tickets will be sold throughout the event for $1 each. CCCB members will be selling them in advance of the event as well. The drawing will occur just before the final band's performance. First prize is a set of 4 Tickets to Cedar Point + a $75 Gas Card, second prize is $150 Cash, and third prize is a $75 Target Gift Card. Winner does not need to be present. Trombone players, join us in a massive performance of "Seventy Six Trombones!" We hope to gather at least 76 Trombone players to play the famous tune from The Music Man with us at our annual concert at Austintown Township Park. The concert is part of Austintown's Independence Day celebration. We hope to have as many trombone players as possible, so whether you play every day or you need to blow the dust off your old instrument, we hope you'll plan to be there. Sign up to play here! We will email the music to registrants soon. Read more about Seventy Six Trombones! The location of tonight's rehearsal has been changed to the Middle School band room. Bring your own music stand.